Multi-Image Mirror Pentagon. The Multi-Image Mirror Pentagon is a 5-mirror, pop-up play area. Compact 11' high pentagon unfolds into a miniature, kaleidoscope theater. 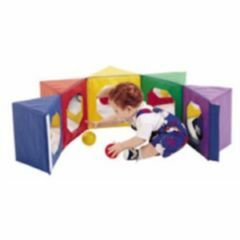 Excellent for speech therapy, cognitive skills, and visual-perception skills. Perfect for both infants and young children. Weighs 8 lbs. Pastel colors.